Donald Trump has shut down the federal government over his demand for $5 billion (now $5.6 billion) for his “big beautiful wall” on the Mexico border, a monument to the stupidity of this man. The amount of money being fought over is a rounding error in what it would actually cost to build his wall. See the Brookings Institute, The Wall: The real costs of a barrier between the United States and Mexico. This is a “crisis” manufactured by the Trump administration in an effort to extort money from Congress, which has routinely rejected his request in appropriations bills. Trump himself has agreed to these appropriations bills until he reneged on the latest deal in December after right-wing propagandists in the conservative media entertainment complex attacked him for agreeing to the appropriations bills. Do we really want right-wing propagandists like Rush Limbaugh and Sean Hannity dictating public policy? Oh, and Mexico is not paying for this monument to the stupidity of this man, you will. Officials at the Homeland Security, Justice and Defense Departments have researched the issue for Mr. Trump. However, no emergency order has been drafted or approved, one official with knowledge of those plans said. One possible solution, in the absence of new congressional allocations, is figuring out a way to steer contracts already planned for Army Corps of Engineers projects toward some kind of barriers. But lawyers at the Homeland Security and Justice Departments have yet to determine if doing so could withstand court challenges, two senior administration officials said. The Constitution does little to define national security powers, and how the branches of government share them. Article I gives Congress the power to support armies and declare war, and call upon the militia “to…suppress insurrections and repel Invasions.” Congress also has the power to regulate international commerce, and establish the rules of naturalization. Accordingly, most of the president’s emergency power derives from statute — laws enacted by the same Congress that might now oppose his actions. The Brennan Center for Justice has identified 136 statutory powers available to the president upon declaration of a national emergency. So, then, the source and extent of the president’s emergency power is complicated. His authority to act contrary to the wishes of Congress is also complicated. It’s happened before, and the Supreme Court has weighed in. Nationalizing the steel mills is a markedly different executive action than building slat fences along the border, and 1952 was a different time than 2018. But Justice Robert Jackson’s famous concurring opinion in Youngstown attempts to give some future guidance to the courts in evaluating the executive’s power during a national emergency. Jackson divided unilateral presidential actions, like the one proposed by Trump, into three categories. First, when the executive “acts pursuant to an express or implied authorization of Congress,” then there’s little controversy because he speaks for the entire federal government. What exactly constitutes an “implied” authorization by the legislature is open to interpretation, however. The second category is the “Twilight Zone.” When the president takes action, but Congress has neither granted nor denied his authority, and there is a “zone of twilight” in which the executive and legislative branches have shared authority. In these cases, the president might act where Congress has remained silent, but that also raises the question of how to define congress’s “silence” on a subject. Trump’s proposed action falls into the third Youngstown category: When the president “takes measures incompatible with the expressed or implied will of Congress,” his power is at its “lowest ebb.” Here, the Supreme Court would have to deny any congressional power to act in the controversy to sustain the president’s exclusive control. In this category, when the president acts in defiance of Congress, he should usually lose — but not always. Indeed, in a 2015 case, the Court upheld the rare exercise of presidential power in category three. If Trump invokes emergency powers against the express will of Congress, he acts at his “lowest ebb” of power. The action would be immediately challenged, and it would likely arrive at the Supreme Court in record time, as Truman’s steel seizure did. Under Youngstown and the cases that have followed, the odds are against the president. But he still could win. But Congress has created numerous statutory emergency powers that the executive can assert. This is certain to wind up in the courts, with funding likely blocked until the case is decided. Trump edges toward declaring wall emergency, but a court fight is likely. What we do know for certain is that Trump and his administration will continue to use the big lie propaganda technique in his national address. 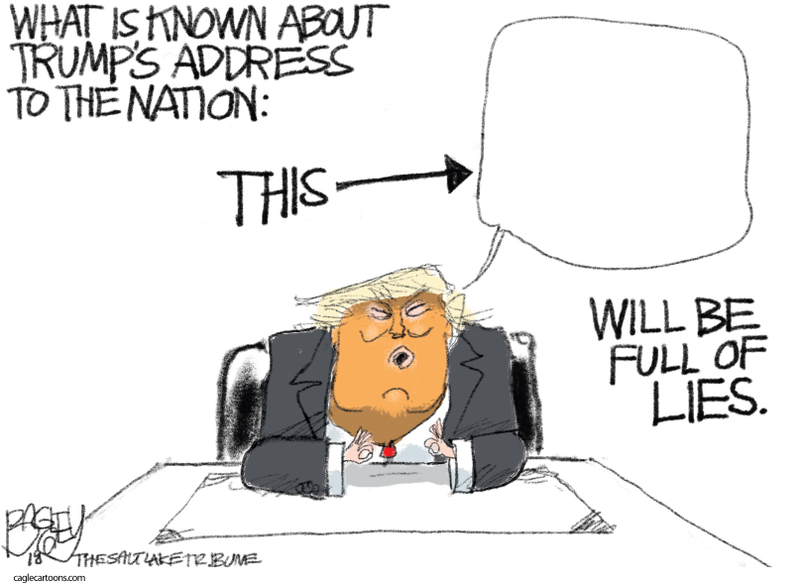 As Greg Sargent of The Post says, Trump wants the networks to carry his speech live. They should look at these charts of his lies. President Trump’s announcement that he’s giving a speech on Tuesday at 9 p.m. — with its absurd hyping of the notion of a “national security crisis” at the border — leaves no doubt whatsoever about the level of agitprop deception Trump intends to employ. So the networks cannot pretend to be under any illusions about his intentions. As you can see, Trump’s dishonesty about immigration has escalated throughout his presidency. And at moments of political difficulty over the issue, the lies and distortions have reached staggering heights: Amid the family separations crisis, those numbers topped an average of well over 100 per month. And in the run-up to the midterms — when Trump made his demagoguery about migrants, asylum seekers and the border central to the GOP’s campaign message — those numbers topped 200. In this case, amid the family separations crisis, the lies and distortions at times climbed higher than 20 per day, and in the run-up to the midterms, they rose at times to well over 30 per day. This chart also shows that, after the falsehoods and misleading statements dropped off after the election, they have spiked again heading into the government shutdown fight — another example of Trump facing a very challenging political moment involving immigration — which is where we are now. The networks cannot feign innocence about the near-certainty that Trump is going to use this speech to lie relentlessly about immigration and the border. It is now a mostly accepted fact among many journalists and producers that Trump’s use of disinformation, as distinct from conventional political lying — in particular, his endless repetition of lies and distortions after they have been debunked — has combined with his relentless attacks on the media’s legitimacy into something that poses special challenges to the institutional role of the press. It’s not really clear to me whether the recognition of the need for such an overhaul must entail the networks refusing to air the speech. Perhaps some form of prominent, aggressive and real-time fact checking could do the trick. 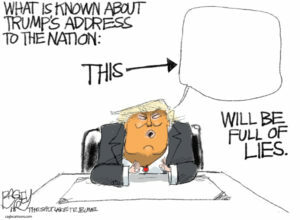 But no one should pretend to be unaware that simply airing the speech will be tantamount to giving Trump a platform to spew what will certainly amount to dozens of unfiltered lies into the political bloodstream, which would send a truly awful signal of what we can look forward to heading into 2020. By allowing themselves to be used in this manner, the networks – and the media writ large – are complicit in Trump’s big lie propaganda campaign. They become mere tools for amplifying the propaganda of Trumpism, the new American fascism, using the tried and true tactics of European fascism from the past century. This is how creeping fascism insinuates itself into mainstream public discourse, making the once unthinkable appear normal and more acceptable over time with the repetition of the big lie. In between his Adderall sniffles, Trump recited a list of crimes by immigrants to start his speech tonight. He forgot to mention that the Italians, Irish, Jews, Poles, and Russians, among others, all brought violent gangs with them to America, and tens of thousands of people have been killed by Italian, Irish, Jewish, Polish, and Russian gangs since. But I’m sure he’ll get around to deporting all the Italians, Irish, Jews, Poles, and Russians right after he gets rid of all the brown people. Well, maybe not the Russians. Without Russians Trump branded condos in Miami would be empty. Lordy what a bunch of “blame the browns for all our problems” the insecure whiny little babies of the GOP have become.